While I don’t eat a lot of meat, bacon is one of those things I just can’t give up. My favorite is a nice applewood smoked bacon, that has crispy edges, with a little bit of tenderness towards the center. Traditionally, most people fry bacon in a pan. However, because I tend to spend enormous amounts of time on food preparation, I have begun to bake mine instead. Who has time to stand over the stove and fry a few pieces at a time!?! I suppose I could buy a griddle, but I don’t have room to store it and I like to keep my belongings to a minimum. When baking the bacon, I can do other things. 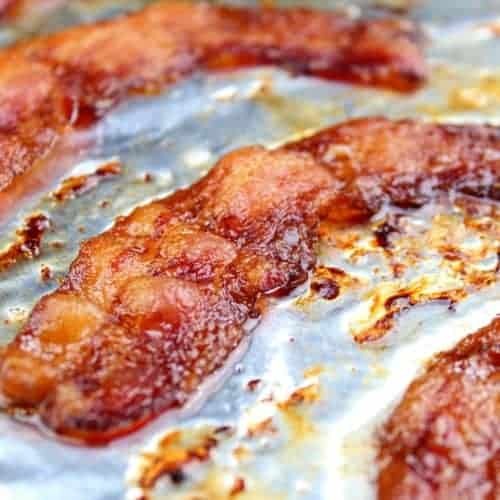 This oven baked bacon is ready in 15-20 minutes. For a chewier bacon, bake at the lower end of the time range, and for crispier bacon, bake at the higher end of the time range. I generally aim for the middle, so that I end up with a bacon that is crispy around the perimeter and tender and chewy in the center. Ok, now my mouth is watering!! 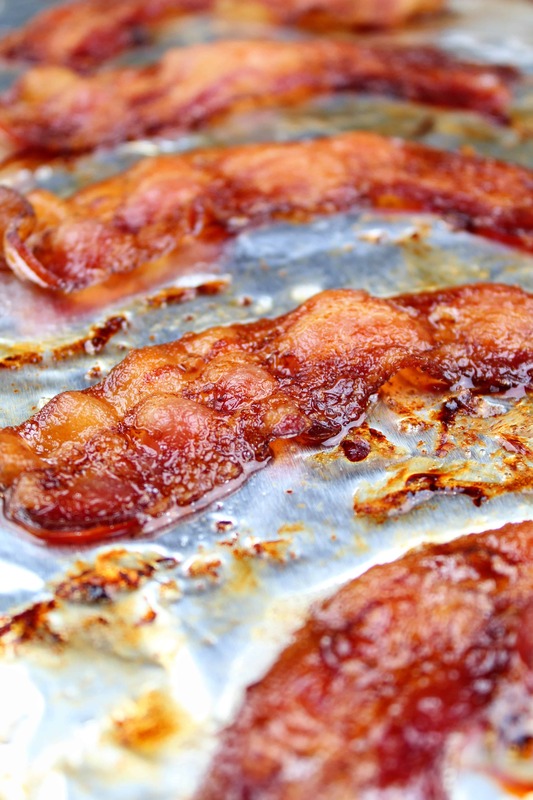 Is it healthier to bake or fry bacon? One of the advantages to oven baked bacon, is that the grease drips away from the bacon as it’s baking if you put it on a wire rack. The wire rack needs to be placed on a rimmed baking sheet to catch the grease drippings. 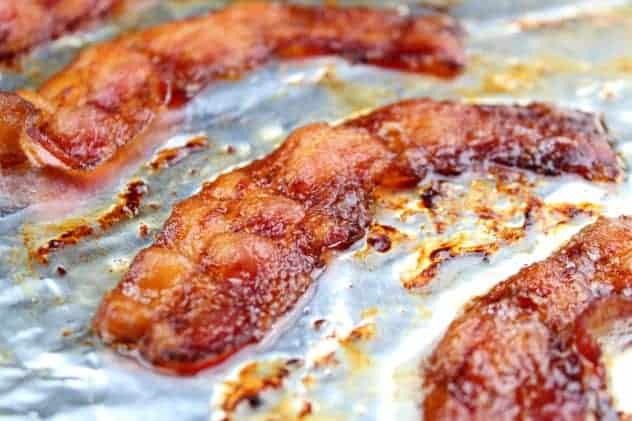 When it’s done baking, you can further remove the grease by transferring the bacon to a paper towel topped plate, and then pat dry with a paper towel. Does bacon splatter in the oven? Yes, a little bit. If you use a rimmed baking sheet however, the splatters will stay contained. How long should you cook bacon in the oven? Bacon should be baked at 375F for 15-20 minutes. The shorter the time, the chewier the bacon. The longer the time, the crispier the bacon. For intermediate times, you will end up with bacon that is crispy on the edges with a tender and chewy interior. My absolute favorite! 1. Preheat oven to 375F. Line a rimmed baking sheet with aluminum foil. If you really want to get rid of as much grease as possible, you can also place a wire rack on top. 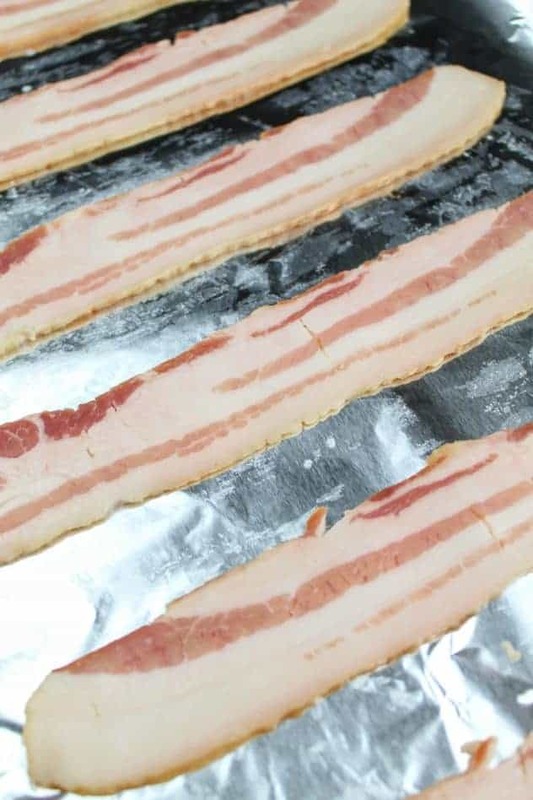 Arrange the bacon in a single layer, with space between each strip. 2. Bake for 15-20 minutes, or until edges are crispy. For chewier bacon, aim for the shorter time. For crispier bacon, aim for the longer time. I generally start to check my bacon at around the 12 minute mark to see how things are going. The bacon I used is the regular thin cut bacon. For thicker bacon, adjust baking time accordingly. This oven baked bacon is very easy to make with little clean up. It's also healthier than frying in a pan. After baking, feel free to crumble it and use it in salads, scrambled eggs, cookies, etc. Or just eat the strips plain as a snack! Line baking sheet with foil and place a wire rack on top to drain off more of the grease, if desired. Arrange bacon on baking sheet in a single layer, with space in between. Bake 15-20 minutes, or until bacon is deep golden-brown and crispy. I check mine around the 12 minute mark. Using tongs, transfer the bacon to a plate lined with paper towels to absorb the grease.